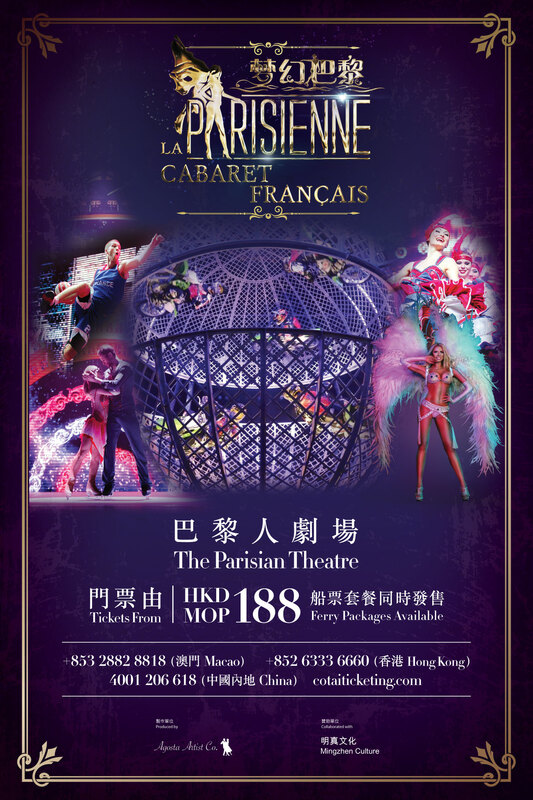 (Macao, Sept. 14, 2018) –Due to the popularity of La Parisienne Cabaret Francais, the season has once again been extended through until Jan. 6, 2019 at The Parisian Macao’s Parisian Theatre, giving guests and visitors a chance to see this wonderful show over the upcoming holiday season. Featuring an international cast of 38 death-defying stunt performers, illusionists, champion skaters, models and dancers, the show is suitable for audiences of all ages. The 65-minute performance blends illusion, dance, acrobatics and comedy with classic acts such as can-can and burlesque dancing, along with gravity-defying basketball acrobatics and the world-renowned Globe of Death motorcycle team. However, while La Parisienne Cabaret Francais is one of the world’s most entertaining variety shows for audiences, behind the scenes are committed artists with years of experience taking calculated risks for the sake of their art. 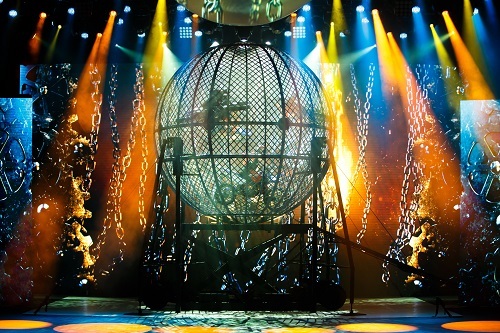 The Globe of Death act is performed by a fourth-generation family from Sao Paulo, Brazil, who have been performing death-defying motorcycle acts around the world since the 1960s. The stunt riders race motorcycles inside a mesh sphere, looping vertically and horizontally at high speed. It takes two years to train to be a rider on the team, first learning the routine on a bicycle. The most dangerous part is when the globe actually splits into two sections, leaving zero margin for error. Ice Skating Adagio is performed by two hugely talented Russian ice skaters, Aleksandr Popov and Elena Efaeva, who have been together for more than four years. They both competed at the European Championships and Olympics, and Aleksandr won a gold medal in the Junior Olympics in Slovenia in 2003. Having performed in over 80 countries and for many celebrities, their beautiful and romantic act includes a spectacular one-hand lift and a ‘bow spin’ which many ice skaters can only aspire to. 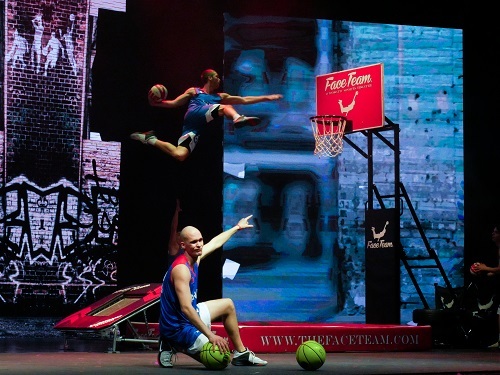 One of the more popular performances during the show is Face Team Basketball, from Budapest in Hungary. With six performers using up to 20 basketballs during their act, they jump, shoot and slam dunk their way around the stage. The team currently holds 10 Guinness World Records, including ‘most basketball slam dunks by a team using a trampoline in one minute’ (46 dunks) and ‘highest slam dunk with a backflip’ (4.9 metres). They have performed for celebrities including Simon Cowell, Harry Styles, LeBron James, Kobe Bryant and the Prince of Dubai, and were semi-finalists on “Britain’s Got Talent”. Not to be missed, the most challenging part of their act is the backflip from the top of the back board, at a height of around five metres. Book your tickets now for La Parisienne Cabaret Francais! Prices range from HKD/MOP 188-488, and can be booked online at www.cotaiticketing.com. Photo caption: La Parisienne Cabaret Francais, which includes thrilling performances including gravity-defying basketball acrobatics and Globe of Death motorcycle racing, has been extended until Jan. 6, 2019. Photo caption: Audiences can enjoy classic cabaret acts including the can can and burlesque dancing alongside more daring routines. 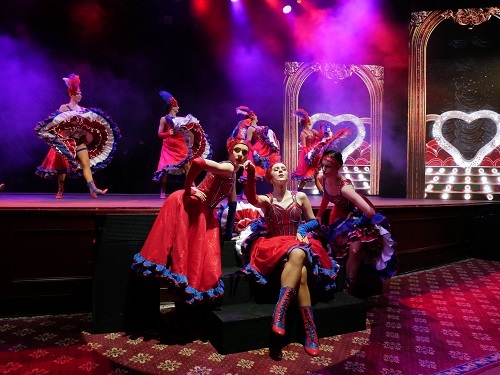 La Parisienne Cabaret Francais is at The Parisian Macao until Jan. 6, 2019. Tickets are still available at all Cotai Ticketing box offices.